Ever since I purchased the AirPods a month ago, they demonstrate extremely poor quality while activating the AirPod Mic, whilst they are connected to a Mac. When activating the Mic to record audio, it seems that both the recording quality AND audio playback quality severely drops to a substandard level (Mono 8.0 kHz). For example, if I invoke Siri (on the Mac directly, or by double-tapping on AirPod), whatever is being said and recorded by me, AND the Siri/Mac/AirPod audio response will be in poor quality. After the recording is done, audio playback quality usually goes back to normal1. Any mic audio recorded to a file will however be in the poor quality; which is why I interpret the issue to affect both recording and playback qualities. The issue appears to be identical to the one discussed in this Apple Support Forum thread. The thread offers possible explanations but no definitive solution or suggested course of action. I have a Late-2013 MacBook Pro Retina. I don't have this problem when using the AirPods with an iPhone 6s. I have tried resetting the Mac Bluetooth interface, tried resetting the AirPods, and so forth. 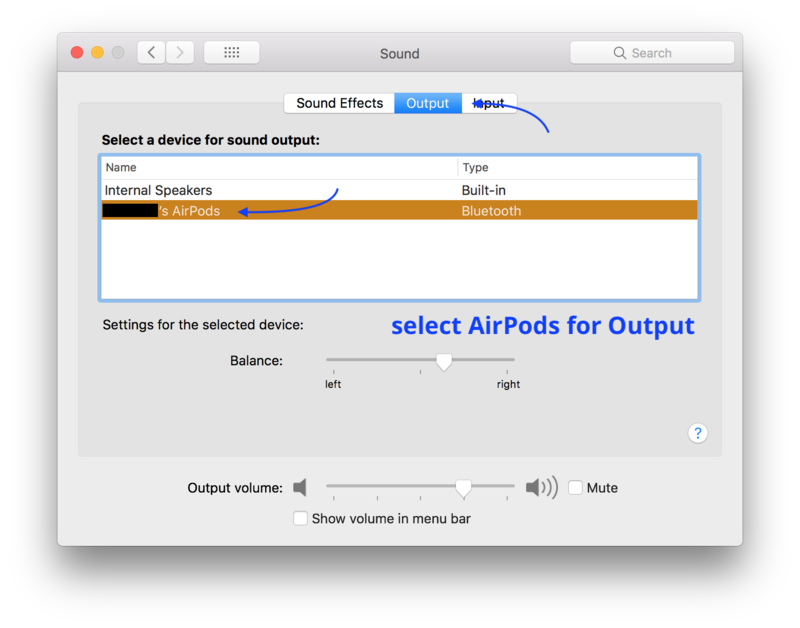 FYI: Using the macOS native application Audio MIDI Setup, I attempted to observe what's happening when AirPod recording is activated. Output quality drops from the standard 2 ch 24-bit Integer 44.1 kHz → 1 ch 16-bit Integer 8.0 kHz. 1It has happened that the Mac has been permanently stuck in low quality until system reboot, and even whenever the AirPods are reconnected afterwards. I had to try AirPod unpair/re-pair, and even AirPod charging case reset to fix the latter situation. OP here – I'd just like to add to the answer below, that I've been in contact with Apple Support. Apple claims that the poor Mono 8kHz quality which affects recording and indeed simultaneously playback on Mac when the AirPod microphones are activated, is because the SCO codec then gets employed over the entire Mac audio system. This is supposedly "expected behaviour" when trying to use the AirPods and other Bluetooth headsets together with a computer, according to Apple. The AAC codec is normally used when just listening to playback on the AirPods. It's just very unfortunate that SCO – low-quality as it may be – upon AirPod microphone activation is not only limited to doing recording, but also displaces AAC and audio playback. Apple Support claims that Apple is looking at this issue, and that improvements might be coming in future firmware updates, but I did not interpret that as a promise to be honest. But for the time being, I'd say that the benefits of making calls and so forth with AirPods on Macs are quite limited. Current best practice is to use the Internal Microphone for Recording, and the AirPods for playback when conducting calls. Input and Output devices can be selected in System Settings > Sound or by ⌥-clicking the Volume icon in the macOS Menu Bar, and selecting devices there. ... they are aware of the issues and a temporary workaround is to switch the mic from the AirPods mic to the internal microphone. On the discussion post you referenced, there was 217 other people reporting that they too had this issue. Many of our readers are letting us know that their AirPods are experiencing a lot of challenges while using them with macOS. In particular, when the mic is used, the AirPods’ audio is very low fidelity and sound quality. Some iFolks claim that they cannot even understand the other person when video-chatting with apps like FaceTime, Hangouts, and Skype. And your callers also report that your voice sounds muddy or that they barely hear you at all. Other than the workaround to use your internal mic, no. My advice is to return the unit to Apple. There may be a fix in a future update to macOS or the AirPod firmware, but only Apple knows when they will issue an update. Given that Apple "silently" released the last update, don't expect too much fanfare with the next one. Personally, I would have returned them and/or opened a support case with Apple as they are the best ones to solve this issue. This is not an issue with your "bluetooth chip" as per the comments. This would be easy to diagnose - test you MBP with other BT headsets. If the problem goes away, it's the AirPods. Use Apple's developer tool Bluetooth Explorer. Then you can use Audio Options (under Tools in the menu bar) to force them to use the alternative codec aptX. That's also where it states that it requires macOS Sierra. ¹ the temporary workaround from the other answer works, obviously, you just have to do it every time. This problem frustrates me to no end. Recently I noticed that when I start a Vagrant/VirtualBox VM (vagrant up), and it prompts me for administrator access (one time I remember it asked for access to the microphone, and I was a bit confused), the audio drops to the low bitrate connection. I always have my mic set to an external USB mic, and speakers set to AirPods, so it doesn't seem (in my case) to be related to the mic input being set to the AirPods. However, knowing that I can more easily see what's happening with the Audio MIDI Setup app, I opened it up, and sat there messing with some toggles a bunch of times, until I came up with the following process which set the audio back to the 32-bit 2 channel mode reliably without a full reboot! Toggle the 'Format' menu from "1 ch 16-bit..." to "2 ch 32-bit..."
Wait for some playing audio to return to your AirPods—it will still be tinny and yucky sounding. This has worked two times for me; other times I tried restarting... just putting this out there in case it works for someone else! Well, I downloaded the "Bluetooth Explorer" from @Alex-Ruyven unofficial link and I tried to force APTx, and it's works partially. When listening to music, I see it's using the "SBC" ( APTx for apple ) code instead "AAC". And I hear a bit lower music quality for playback music. The problem is as soon as we connect the microphone, it still changes the code to SCO so still the same problem from the beginning. Really hoping Apple fix it quickly because having a 100% Apple ecosystem and this issues on calls it's not the idea I got when I bought the Airports. Well, hope to see an update soon. Not the answer you're looking for? Browse other questions tagged mac audio bluetooth microphone airpods . Accept Incoming Call from iPhone on Mac through AirPods (while Mac connected to iPhone Hotspot)? Do AirPods directly benefit from better LAN Wi-Fi? Can AirPods' double-tap to Play/Pause be made to work in other macOS applications than iTunes?